According to a study by Ipsos Mori, the British people seem to believe themselves to be surrounded by foreigners and scroungers. People perceive that there are five times as many Muslims as there are in reality. They believe that there are three times as many unemployed. They think that Christians are only a third of the population, when in fact they are almost double that figure. What to make of it? I once heard a theory that people are divided between left wing and right wing according to whether they are friendly to strangers, or fear strangers. If while walking along the street, we see a person walking towards us, do we imagine that person to want to help us, or want to rob us? A person would be a Conservative voter if their instinct was that the stranger would do them harm, while a person would be a Labour voter if they instinctively believed that the stranger was full of good. It is not unnatural for a person to feel threatened by members of another tribe; it is human nature, the survival instinct. We are more alert to danger than we are to safety. Therefore, if a white person walks along the high street and passes ten white people and ten Muslim people, according to this theory, he would remember the Muslims if he considers them threatening, but he has no reason to remember the white people, because they stir no fear. On this basis it would be natural that he recalls the high street to be teeming with Muslims, and sparse of whites. This graph is a vivid demonstration of the government’s failure to create a society at ease with itself. It is the role of the politician to bring society together; to cause us to bond as one united tribe. In the aftermath of 911, engendering a national identity became a higher priority than encouraging the identity of diversity. However, that policy was aimed only at minority populations. This graph shows that amongst the majority population, the sense of division is deep. The policy of “empowerment” under the previous Labour government directed resources towards minorities, and this caused resentment among others. As a result, it has been necessary for Ed Miliband to express empathy with the white population. However, the problem now is that both the Labour and Conservative leaders are competing to be negative about immigration, and this pushes the issue up the political agenda, beyond its intrinsic importance. With immigration promoted as a major national problem of our time, a man who feels threatened by the Muslims in his high street doesn’t challenge his negative thoughts and feelings. It doesn’t occur to him that he is at fault to bare such hostility. Instead he is reassured by the politicians. It is right and rational to have feelings of discomfort towards this foreign tribe, since immigration is a major problem for our country. Mr Cameron and Mr Miliband have both said so. Lots of people have thoughts of hostility to strangers, but are aware of this hostility and challenge it. I know because I do this myself. So even though I might have an initial thought of discomfort about a stranger, I recognise this as negative and push the idea away. I am a Labour voter not because of my instinct, but because I was brought up to be kind and thoughtful to others. It’s nature versus nurture. As long as the politicians are competing to be nasty, the man on the street will consider his negative thoughts to be normal, and will fail to challenge them. So in order to win over the forces of negativity, the politician must persuade the country of the virtues of being one united tribe. 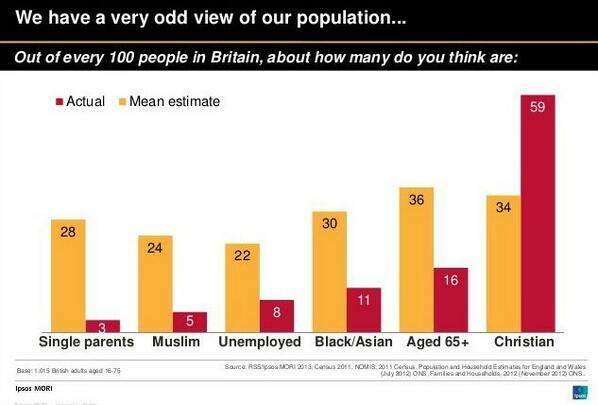 With this in mind, maybe now is the time for Ed Miliband and others to advocate the benefits of diversity. It’s time for the positive message to prevail. This entry was posted on Monday, April 14th, 2014 at 1:04 pm and is filed under Race & Community. You can follow any responses to this entry through the RSS 2.0 feed. You can leave a response, or trackback from your own site.